My dad very much wanted me to be a saxophone player. I’m grateful (… now) for him pushing me. My father was a big jazz fan and was a “bedroom” musician as a hobby. Miles Davis, Weather Report, Charlie Parker, John Coltrane, Sonny Rollins, Jackie McLean and Ronnie Scott, always was running through the house, so I was exposed to it at an early age. When I started showing interest in the sax at age 8, it was all I’d ever heard, really. My father sort of frowned on any sort of popular music. I was playing the recorder at age 8, my dad noticed that I had good finger dexterity, and he asked me if I’d be interested in playing the sax. I said sure, so he started saving. When I was 13, he bought me my first sax and said “right, this is what you’re going to do for the rest of your life.” My reaction was a bit terrified (WTF!! ), but in hindsight, I’m grateful for the amount of discipline he instilled in me. The sax didn’t click with me at the start. In fact, I’d thought of taking up the trumpet, I loved the muted trumpet sound that Miles Davis was putting out, but I stuck with the sax. I couldn’t get a note out of it at the start. My sister, on the other hand, could play all kinds of notes, which irritated me!!. I had a few private lessons and studied a lot of books, but it wasn’t until I went to music college that the penny really dropped. One year (1987? I think) at music college, I had three days when I didn’t have any lectures. I would put in 12 hours of practice on each of those days, which covered a huge amount of ground and really made me realize that iwanted to pursue music as a life’s endeavour. That year was also the first time I’d heard Michael Brecker, who became my sax guru. In late 1988, a friend introduced me to Brecker’s first solo album “Michael Brecker” on Impulse and it just blew my mind. He was the first sax player I’d heard where I liked EVERYTHING he was doing, it all made sense to me, it spoke my language. That was the point where I switched from just wanting to be a sax player over to NEEDING to be a sax player. It was a real epiphany for me. 2) What would you be doing if you weren’t a professional sax player? When I was a kid, I loved to take things apart and put them back together. In fact, when I was four, my mum found me behind the TV with the back taken off, and I was taking bits out. The TV was plugged in and turned on at the time, which she wasn’t too happy about!. I would get cast off radios and such from a junk shop run by a friend of mine to tinker with. To this day, I love DIY projects. So I guess I would be an engineer,mechanic or something like that! I was really into Art for many years too … Mainly pencil, but I just dont have the time any more! So maybe a mechanic… or an artist… or maybe a cook, did I mention that I LOVE cooking!?? 3) What was the first record you bought for yourself? Ha, I remember it well, it was a German pianist named Rolf Kühn. It was an album called “Don’t Split.” It wasn’t really my thing, but I bought it because Bob Mintzer, the saxophonist with the Yellowjackets, was on it. I’ve always loved Bob Mintzer’s playing, he was a top session player in New York round that time (early 80′s). I always admired how the top session players like Brecker and Mintzer could step into a recording situation and instantly nail a sax part on any kind of music. They didn’t just have jazz chops, they could play a perfect 8 bar pop solo, they could sight-read and interpret the music perfectly. This shaped my view of the type of musician I wanted to be, I wanted to do what they could do. I won’t say I’m there, but I’m getting the call for various types of projects now and I love it. 4) How did you get connected with Level 42? In 2001, my then-girlfriend (now-wife) and I were in the lake district in the northwest of England for four days. Lots of picturesque landscape and mountains (ok, large bumps and hills… challenging walks, shall we say). I was pretty much off the radar as far as mobile phone was concerned, until we started home. We were on the four hour drive home late one evening after this lovely trip. I turned my mobile phone on to find a multitude of messages from Lyndon Connah, all just “Um, Sean, please call me, I have some gigs for you.” Nothing about who it was or how many gigs. My girlfriend was driving, so I called Lyndon and he said all the gigs were going to be with Mark King of Level 42. I thought, flippin’ heck… GREAT! Then I found out that they were almost to the end of their two weeks of rehearsals. They wanted me to come in the next morning and do an audition and meet the guys. I went into the studio the next day, a bit terrified, mostly because I’d had so many days off and wasn’t on top of my game. Mark King gave me a quite a challenge. He started up The Sunbed Song, which has quite a long section for a sax solo at the end. 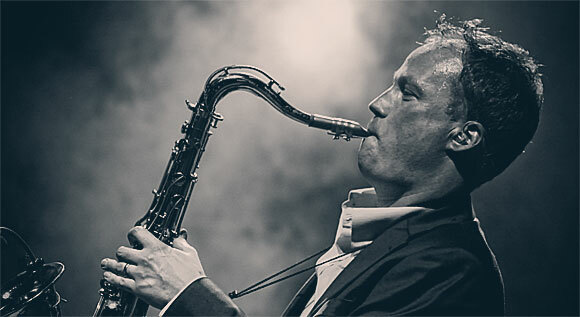 And it’s in a nasty key for the sax, Eb flat minor, take NO prisoners type solo – right in at the deep end… I had it in my head, does Mark want pop chops?, does he want funk chops?, does he want jazz chops?… So I just did MY thing, put my head down and charged through it. As it turns out, he wanted to hear Sean Freeman chops, he just wanted to hear what I could do. So, we played the song a couple of times, then the boys went out for a break and a cup of tea. Mark asked “so would you like to join the band?” After spilling my tea on my hand, I said “Yes! … Great!” … that was it – I’ve been there ever since. 5) Any particular memories of that first tour with Mark King? Yes, my brother was a huge Level 42 fan. I grew up listening to him play the Physical Presence live album and always loved (and still love) the song Foundation And Empire. Krys Mach’s playing is fantastic. On the first tour, we recorded the Live At Reading DVD and that song was on the playlist. It was such a great feeling to be able to play on that song that I’d heard so many times and loved so much. I was able to meet Krys Mach after the Los Angeles show on our 2010 US tour, and it was such a pleasure to tell him how much his playing had inspired me. He was so gracious, just a great man. 6) Who haven’t you played with, that you’d want to play with? Oohhhhh, that’s a tough question… there are so many, some of whom have unfortunately passed away, Don Grolnick being one of them. But Mike Stern, I’ve always loved Mike Stern, not just because of the Brecker connection, I love his playing. I would jump at the opportunity to play for him. Definitely Pat Metheny, I’m a huge Pat Metheny fan. I suppose people like Tower of Power, Steely Dan, the groups that have great sax players come and go, I’d love the chance to play with them. The Yellowjackets, as well. 7) Any gigs stand out to you as your proudest achievement so far? Another tough question… I’ve done so many great gigs with Level 42… The North sea jazz festival with Billy Cobham was a very memorable experience! !… The 2010 US dates were incredible, playing in Japan is always a blast!!! That’s it for now. Have any questions for Sean? Visit the Ask Sean page and fill out the form! Sean will submit answers as time permits.